Sunday, July 17th, 2011 at 10:50 am. 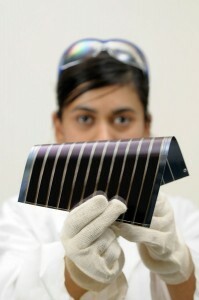 Dye-sensitized GrÃ¤tzel solar cells have just set a new efficiency benchmark. By changing the composition and color of the cells, an EPFL team has increased their efficiency to more than 12%. Their results have been published in Science. Â A group of scientists in EPFLâ€™s Laboratory of Photonics and Interfaces, under the leadership of EPFL professor Michael GrÃ¤tzel, has improved the efficiency of GrÃ¤tzel solar cells to 12.3%. This performance is now comparable to silicon-based solar panels that are on the market today. And the costs of using this technology have come down slightly. The challenge was to increase the efficiency of the dye-sensitized cells, in order to produce more electricity. To do this, the chemists replaced the standard dye componentsâ€”ruthenium and iodineâ€”with porphyrin and cobalt. This combination allows them to increase the absorption of sunlight and results in a more efficient electron exchange. Itâ€™s this exchange of electrons from the dye to the substrate that produces electricity. GrÃ¤tzel cells mimic the process of plant photosynthesis, and these new dye-sensitized cells take the imitation even closerâ€”the new chemical combination gives them a greenish tint. This color increases the efficiency of the process that converts light energy into electricity. To get the most out of the light coming from the sun, the cell absorbs the colors of the spectrum with the highest energies and rejects the rest, which includes the green wavelengths. GrÃ¤tzel cells can be used to create flexible, transparent solar panels. Theyâ€™re a promising alternative for certain applications in which traditional rigid, silicon-based panels cannot be used. In addition, this new efficiency benchmark brings them well within the efficiency range of silicon cells: the theoretical maximum efficiency of GrÃ¤tzel cells is now 30%, compared with 26% for silicon. A group of scientists in EPFLâ€™s Laboratory of Photonics and Interfaces, under the leadership of EPFL professor Michael GrÃ¤tzel, has improved the efficiency of GrÃ¤tzel solar cells to 12.3%. This performance is now comparable to silicon-based solar panels that are on the market today. And the costs of using this technology have come down slightly.